An anime based on the Love Live! Sunshine!! project has been announced at the recent Love Live! Sunshine!! Aqours Niconico Live Extracurricular Activity ~First Heart-Pounding Live Broadcast!~ that is currently being scheduled for a Summer 2016 broadcast. Earlier in the month Dengeki G’s magazine hosted a poll to allow fans to name the 9 idols of Ura no Hoshi Girls Academy. The name Aqours was chosen by fans for the idol group. 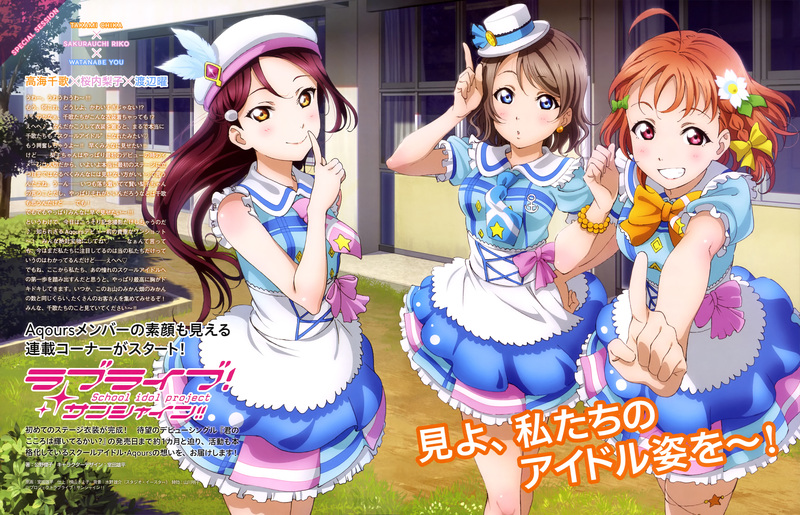 A poll was also set up for the first series, Love Live! School Idol Project, where the name μ’s was chosen. The idol group themselves will be featured in the Love Live! School Idol Festival mobile app, which will include a new story starring Aqours. The group will also host their own stream starting on January 22nd. The Love Live! Sunshine!! anime is currently in production and will air this July, during the Summer 2016 anime season. The group’s second single will release on April 27 in Japan. Further information about the project will be revealed at a later date. Tags: #ラブライブ, 2016, Aika Kobayashi, Aina Suzuki, anime, Anju Inami, anniversary, announcement, april, April 2015, Aqours, Arisa Komiya, Dengeki G's Magazine, Dengeki G’s, idol, images, japan, Kanako Takatsuki, love live, Love Live! School Idol Project, Love Live! Sunshine! !, LoveLive, music, Name, Nanaka Suwa, new anime, october, Rikako Aida, Shuka Saito, summer, Summer 2016, sunrise, visual, アニメ, ラブライブ! School idol project, ラブライブ！ サンシャイン! !